It's been really busy around here lately, and combining that with not having much to say, the result is a pretty quiet blog. There are now so many great bloggers out there, just about anything I think of to blog about, someone else already had the same thoughts and wrote a great post about it! Rather than turning the blog into a blog aggregator, just linking to those other blog posts, and considering how little time I've got available, I will be posting far less often, at least for a while. So, what's keeping me so busy? Trying to pay the bills is at the top of the list, of course, but that's just the tip of the iceberg. I am now match director for two six stage steel matches a month at my local club, and I'm also working hard trying to get the club to expand the facilities to what could be truly a world class facility. 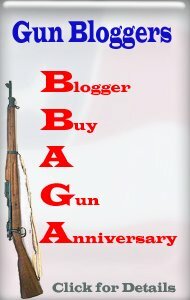 I am keeping busy organizing and coordinating the Gun Blogger Rendezvous set for Reno in September. You have no idea just how much time something like the Rendezvous can take until you actually organize one yourself! If any of you want to help, I really need some help in publicizing the Rendezvous. We need to get a few more bloggers out there.! I am shooting a steel match just about every weekend, and sometimes two. For example, on Friday KeeWee and I will take our mini-RV and drive across the state to Yakima for theYakima club's big match of the year. It will be an eight stage sanctioned Steel Challenge match. I will shoot my High Standard/Volquartsen/OKO rimfire racer in Rimfire Open, and my 9mm. Tanfoglio Gold Custom/OKO in the Open Division. KeeWee will also shoot a High Standard/OKO in Rimfire Open. As soon as the match is over, and even before the results are posted, we leave Yakima for Ssherwood, Oregon, for the Man of Steel Championships, held the next day. Man of Steel will be a nine stage match. After that match, we drive home, getting back late Sunday night. Wednesday morning I climb about the airport shuttle for an hour and a half ride to Seattle Tacoma Intl. Airport to catch a flight to Amsterdam. I get into Amsterdam at 8:30am local time, Once there I catch a train (actually three trains, I think) to get to Winterswijk, which is South East of Amsterdam close to the German border. Friday and Saturday I will be shooting in the European Steel Challenge championships. On Sunday I will be able to watch the other shooters, and get a chance to visit with everyone a bit. Sunday afternoon/evening I will probably leave Winterswijk for Almere, a suburb of Amsterdam, if I can find a ride with someone. Otherwise, I will probably take the train on Monday morning to Almere. Once in Almere I will hang out with my friend Wim and also work on some business possibilities. Tuesday morning early I head back to the Amsterdam/Schiphol airport for the long flight back to Seattle. I get back Tuesday night. On Sunday there is a club championship match in Puyallup, Washington that I hope to shoot. The next weekend I am putting on a steel match on Saturday, and another one on Sunday. There is a match just about every weekend through Fall! With all of the matches, there is also a lot of time spent keeping the race guns running, ammo testing, reloading, and other mechanical work. Magazines need to be cleaned, batteries changed, lenses cleaned, guns cleaned, and so forth. One of the keys to any success, beyond equipment preparation, is practice. To be competitive you have to spend a lot of time on the range. The top shooters will go through sixty thousand rounds in a season! I don't shoot anywhere near that much, but I do go through a lot of ammo. FIOCCHI, the ammunition manufacturer, has signed me as a sponsored shooter. They only sponsor three rimfire competitors, so being one of the three is quite an honor. Unfortunately, they don't have any ammunition for me yet, as they are not only sold out but back-ordered well into the Summer. That will certainly help a bit financially once it becomes available. Part of the deal, though, is that I can't sell any of it, it's only for shooting by me. Once things loosen up, though, I plan to start stocking and selling FIOCCHI products. The OKO Red Dot Sight business is growing very slowly as I just don't have the money to promote and advertize them. It's a shame, really, as they are truly outstanding, particularly in terms of accuracy and quick target acquisition.I am in the process of building a brand new website for the OKO sights and the Magnum Mount Sight mounts I make. That should help. So, that kind of sums up where I've been, what I've been up to, and why there hasn't been much blogging going on. I'm starting to push GBR2013 at Daily Pundit, MC - and yes, I'll be there again this year.